Home » Uncategorized » What Stories Will They Tell Themselves? What Stories Will They Tell Themselves? 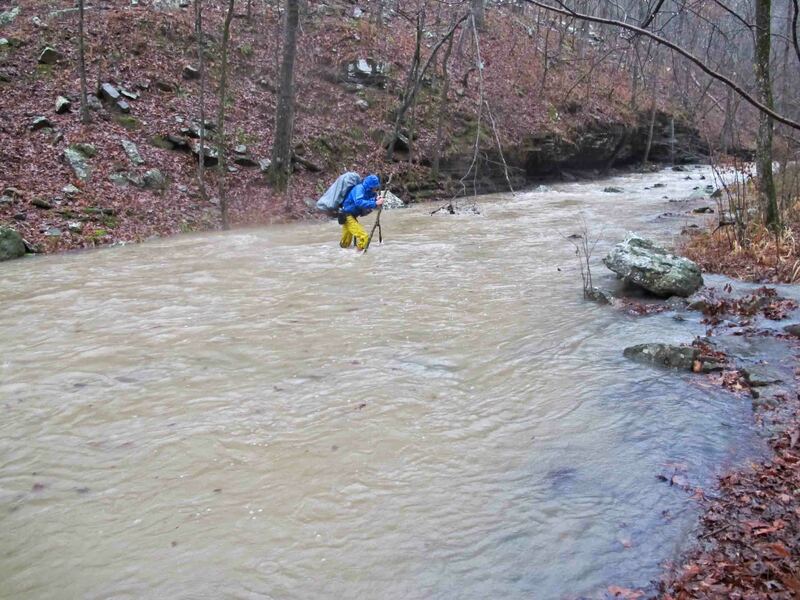 Fellow hiker crossing a swollen Spirits Creek. One of the two photos from a rainy day. Day three of a backpacking trip in December was cold and wet. It was also the day I found that my old raincoat was no longer waterproof. 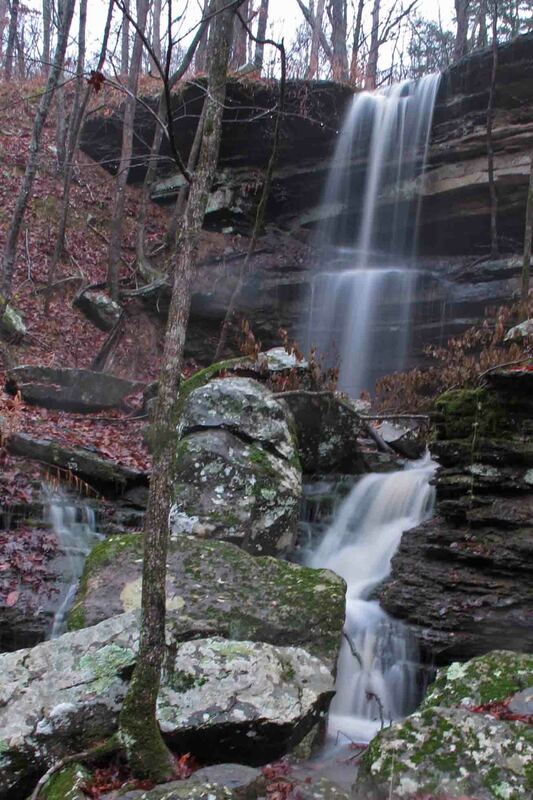 Early that morning we crossed a swollen Sprits Creek on the Ozark Highlands Trail. I took two photos, packed my camera away in a waterproof stuff sack, and never took it out again for the rest of the day. That day was not eventful other than that scary early morning creek crossing. We just hunkered down and walked through thirteen miles of cold and constant rain. Being a compulsive photographer, I have 40-50 pictures from every other day yet, my memories of that third day with only two photos are among my most vivid. I would later see that cold day as one of several peak experiences on that thirteen night trip. Two later events stick out in my memory. The first was a beautiful sunny day when we climbed up the Narrows (sometimes called the “Narrs”). It was like a sidewalk in the sky with sheer bluffs on either side. 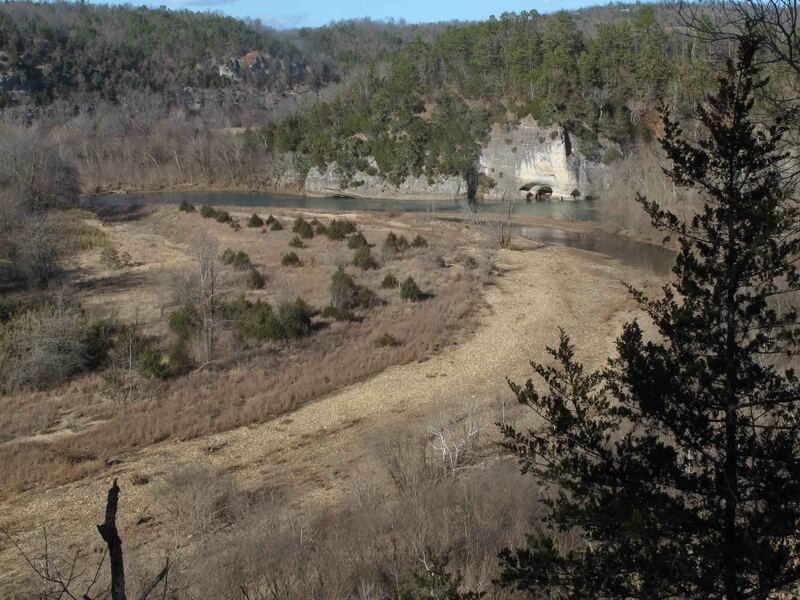 Views of “skull bluff” and the Buffalo River far below were a thrill to see. On our next to the last day, we were within the last ten miles of our 180-mile trek when we realized we were off course. We like to say we weren’t lost, just confused for an hour or so. We backtracked and discovered our route with great relief because daylight was growing short. 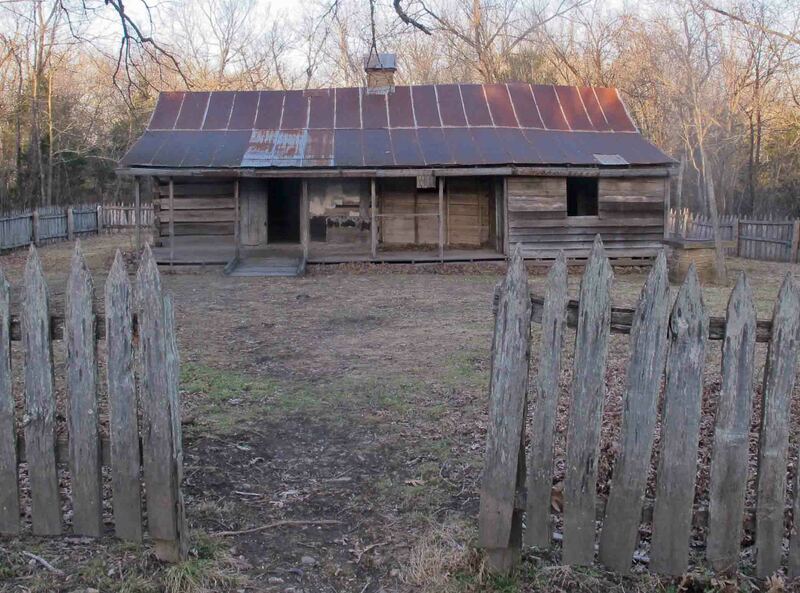 That night we camped in a beautiful cedar grove close to Collier Homestead. This experience of being “lost” and then found formed another peak experience. On our last day, I walked slowly, not from fatigue but from a desire to make the experience last. We even added a couple of miles that were not part of our original itinerary because we wanted more time on the trail. Every step felt like a special gift. I found myself mentally planning my next trip, already excited about tackling another trail. The memory of that pleasant last day and those earlier “peak” experiences became a lens through which I viewed the totality of that winter backpacking trip. Nobel Prize winner Daniel Kahneman describes this phenomenon as the “Peak/End Rule.” He explains that each of us has an “experiencing self” and a “remembering self.” Our “experiencing self” lives in the present. Our “remembering self” determines how we interpret experiences based on a few peak events and how the experience ends. The interpretations of our “remembering self” also influence future decisions. With this “peak/ending rule” in mind, the month of May becomes critical in schools. We sometimes hear phrases like “winding down the year” or “coasting to the end” but these are destructive approaches. These last weeks have a strong impact on how our students remember the totality of this school year and future decisions about learning. I have very clear memories of my worst teacher. The “peak” experiences in her classroom were periodic emotional outbursts and strong negative messages. There were no community building rituals or end-of-year celebrations. Fortunately her negative impact was somewhat mitigated by good teachers. My fourth grade teacher, Ms. Break, supplied memorable “peak” experiences as she performed oral readings for our class or connected with us as individuals when coaching us on schoolwork. While she had a stern streak, I have only fond memories of her. 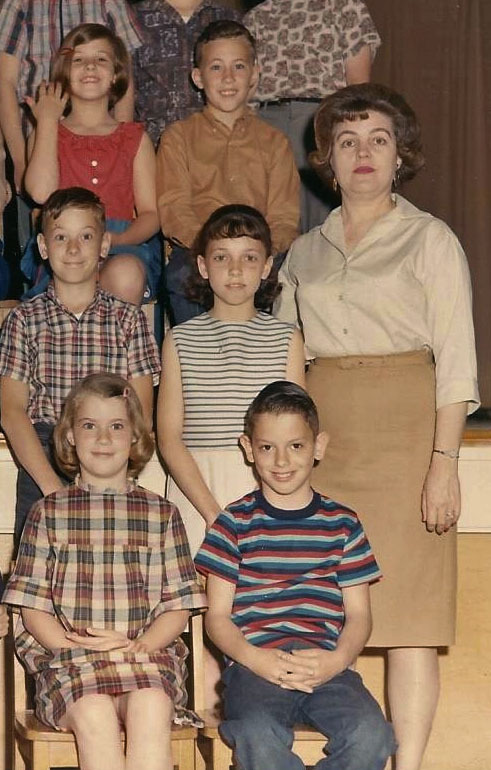 Years later as an adult, I would greet Ms. Break as if I were still in elementary school, so excited to see my teacher. I remember fourth grade as a good year. Daniel Kahneman says, “The remembering self is a storyteller. And that really starts with a basic response of our memories – it starts immediately. Our memory tells us stories, that is, what we get to keep from our experiences is a story.” Look for opportunities to create peak and positive ending experiences so the learners in your school will tell themselves positive stories about this year. The results will be students and adults who are excited about continuing their learning this summer and into next year. Students and teachers will remember you favorably, but more importantly, you might shape future decisions about learning that will impact many lives for years to come. Written for the May issue of the Arkansas Association of Educational Administrators’ newsletter. Second picture from day three. By ozarkmountainhiker in Uncategorized on April 29, 2014 . Thank you, sir! It’s nice to get in the woods and think. Hope we’re helping form good memories for our students.